My name is Lucas Tafur. I have a BSc and Licentiate degree in Nutrition and Dietetics, a MSc in Biochemistry and Molecular Biology, and a PhD in Molecular Biology. In the lab, I study the relationship between protein structure and function. On my spare time, I read and analyze scientific studies from diverse topics, mostly on nutrition and metabolism. Due to my background, I rely primarily on molecular data and build up from there. My goal with this blog is to critically analyze studies focusing on muscle hypertrophy, nutrition and metabolism, in order to broaden the discussion and, hopefully, promote critical thinking. To ensure that all articles are scientifically valid and to increase the quality of the content, since December 2018, articles will be peer-reviewed by experts in the area of discussion before publication. Although it is possible that this pre-publication strategy does not occur for all future posts (due to several reasons), I will do my best to ensure this happens for most of them. I think that reputable online articles should keep the good things about the peer-review process, like fruitful pre-publication discussions and content quality check. As the peer-reviewing in scientific journals is done ad honorem by experts in the field, this can also be readily incorporated into information not published in a journal but with similar scientific quality. Hopefully, this will reduce the need for “being published” in order to be considered a valid scientific reference, specially when the article is a review or opinion piece on a topic. In this way, science is not constrained by paywall, word limits and subjective assessment by anonymous reviewers. 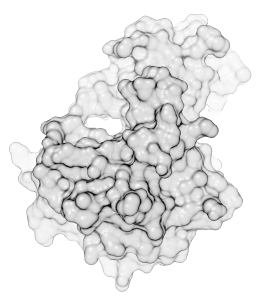 Header image taken from the crystal structure of phoshporylated p70S6K1 (PDB 3A62).